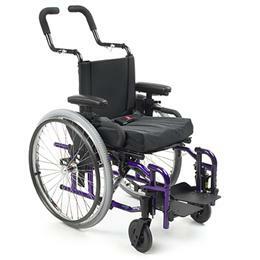 The Invacare® Allegro is the most exciting and versatile folding wheelchair in the industry. Designed from the ground up as a complete mobility system, the addresses multiple positioning needs and growth requirements. Its adjustable-depth and adjustable-angle back ensure a perfect fit and can adapt to any seating and positioning system. The unique modular cross-brace system is an industry breakthrough which provides an expanded variety of growth options. Together, these features combine to create the most versatile folding wheelchair in the industry. with Invacare the possibilities are endless.